Treibball (pronounced TRYball) is a new way to play with your dog! Treibball is a sport which involves teaching dogs to herd large, inflatable balls into a pen at the direction of the handler. It’s a competitive sport for dogs of all ages and sizes–it promotes better teamwork and communication between a dog and his handler. It’s great fun for any energetic dog who works well off-leash and needs a job, or any dog who likes to herd and doesn’t have sheep! Treibball began in Germany to give their energetic dogs some much needed mental and physical stimulation. We think it’s a great game–perfect for dogs and their owners, too! It’s fun for any dog that loves to play chase games, to herd or just use their amazing, problem-solving ability. Competing in Agility takes special equipment, the ability to run with your dog and direct him through each obstacle. Treibball promotes the same kind of teamwork and communication, but does not put any physical stress on the handler. It also builds confidence for the shy dog, and helps reactive dogs with impulse control. Unlike typical dog agility, Treibball doesn't require that you the handler run along tirelessly. By using your voice and other commands, you and your dog work as a team to drive the balls into a goal within a set period of time. Is Treibball Suitable for All Dogs? Treibball requires your dog to be off the leash and to expend quite a bit of energy! If that sounds like your pet then Treibball is sure to be a fun and rewarding game for both of you. What Does the Game Involve? The game begins when a whistle is blown and the timer then starts. Your job is to get the dog to move one ball in particular into the goal first. From there you direct your dog to move specific balls, one at a time, into the goal. 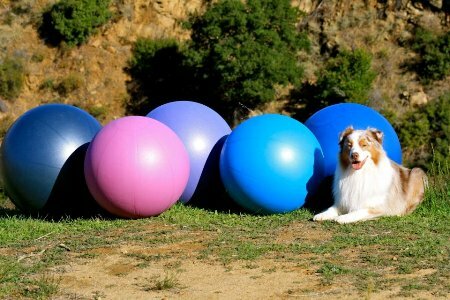 Once all the balls have been placed in the goal, your dog should then lay down in front of the balls and the game ends. You could liken this to herding eight sheep into a pen and the dog then holding the sheep in place with his or her presence at the entrance to the pen.